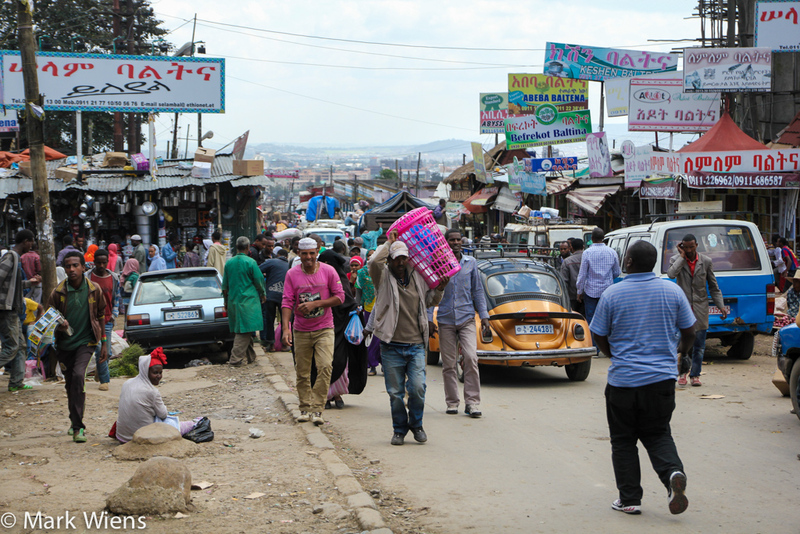 If you’re a market lover, one place you can’t miss when you visit Addis Ababa is Addis Mercato. 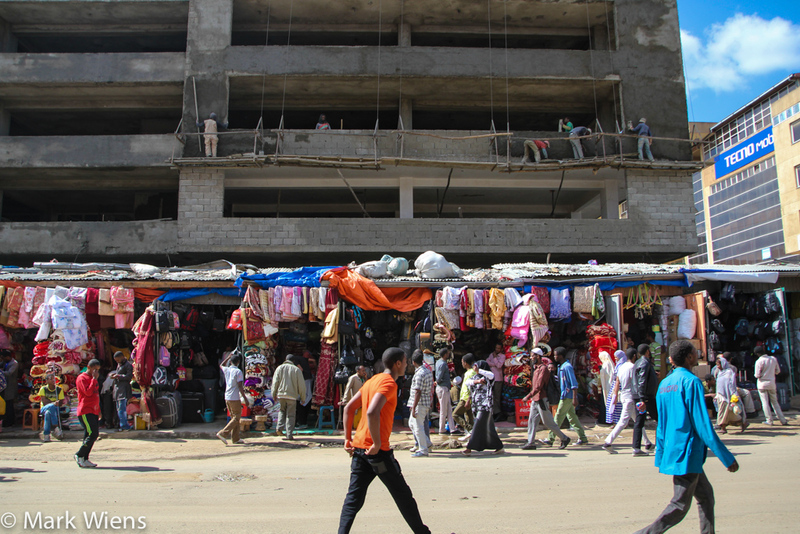 It’s considered Africa’s biggest market, an open air sprawl of vendors that goes on for kilometers; It’s one of those markets that weaves in all directions and you never know what you’re going to stumble into or what you’re going to find. At the market there’s a section for just about anything you can imagine. The first challenge is actually getting there. The streets that surround the market are just about always choked. Whether you’re in a taxi, bus, or minivan, it’s much quicker to jump out of the vehicle and start walking. 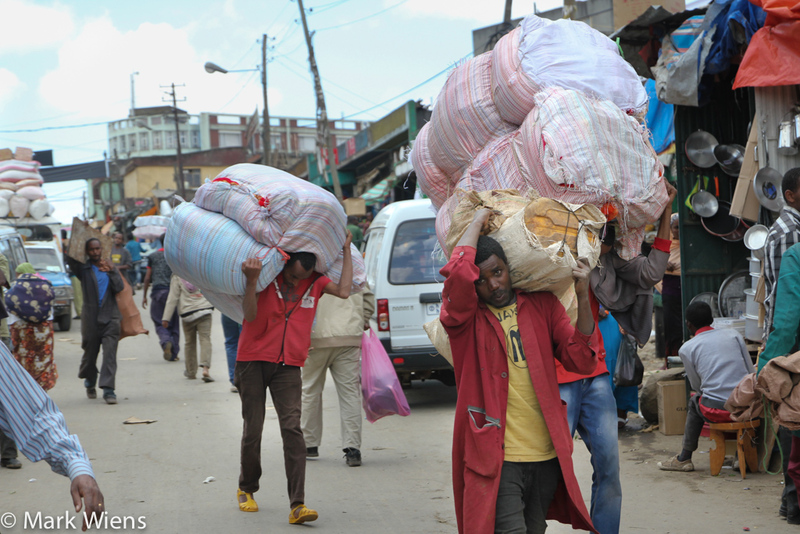 Just be extremely careful when you’re walking on the roads around the market. Due to such heavy and never ending streams of pedestrian traffic, drivers have no choice but to just gun it and go when they have an inch of space, without paying any attention to walkers. I witnessed at least 10 near “human squishings” between two vehicles… but then again, this is how the system works, and near misses aren’t hits. 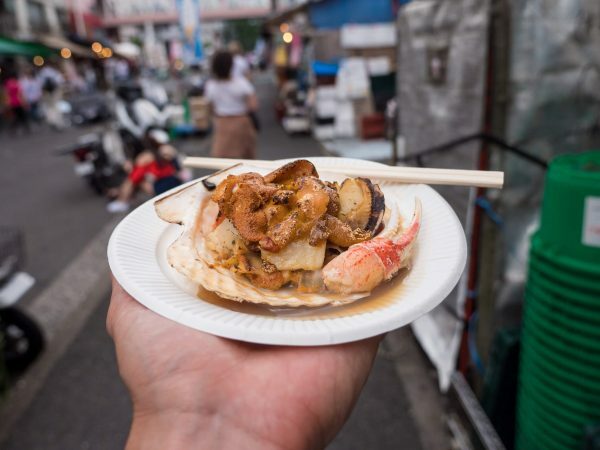 Navigating the market, with the many different sections, and the continual flow of vehicles, people, and livestock, can be a little overwhelming – but it’s an amazing site to see. 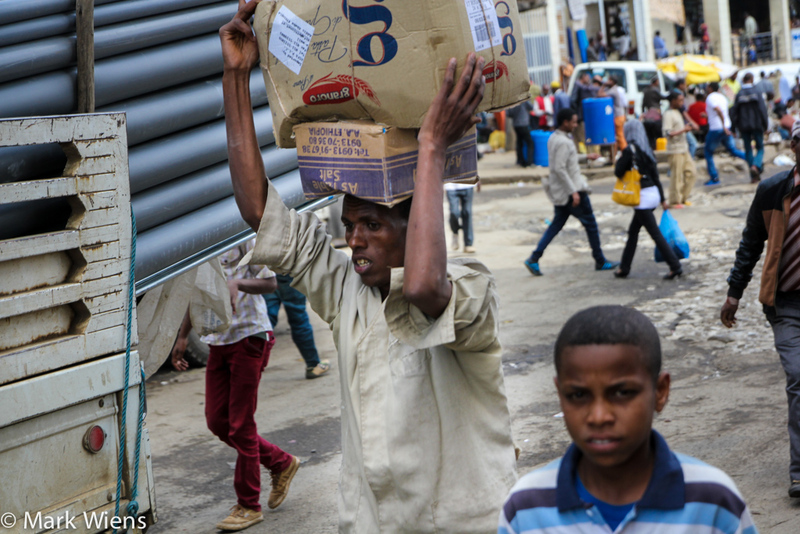 From India to Congo, I’ve seen quite a few people carrying things on their heads, but I have never seen so many people all at one time carrying giant things on their heads as much as at Addis Mercato. 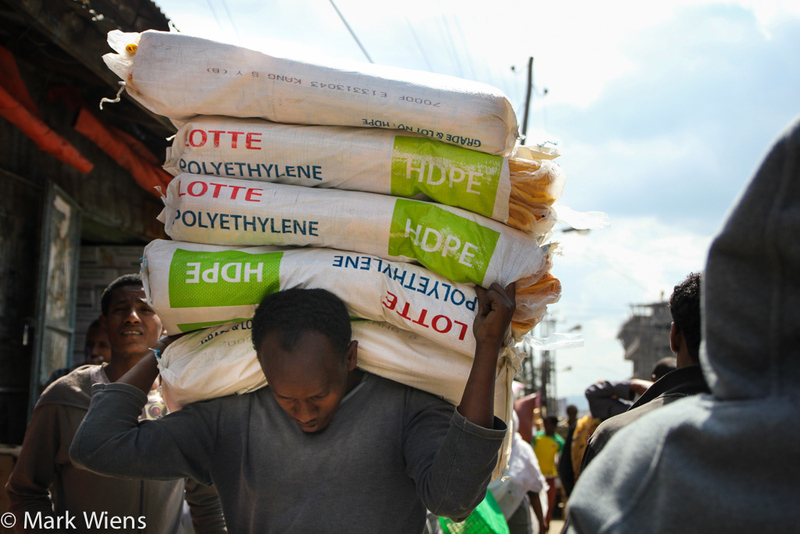 Literally everywhere I looked there were porters running back and forth with mega-loads on their heads. I’d turn around and then have to duck under someones load. Many of the porters carry such huge and heavy (or just wobbly and odd sized) loads that they can’t really see exactly where they are going. So they just have to go, and often quite fast as their loads are heavy. When you’re slowly strolling through the market, especially the narrow lanes, make sure you step out of the way of porters with loads, or you indeed will likely get hit. You’ll also find donkeys throughout the market helping deliver products throughout the market, especially the really heavy items. One of the many things I love about Ethiopia is the importance of livestock in their culture and livelihood – and not only this – but how shepherds and their herds of livestock roam freely through Addis Ababa. It’s always interesting to see a market in turbo mode, everyone rushing from place to place, and all of a sudden having to halt as a flock of goats slowly blocks the road. Another interesting part of the Mercato, which I could easily watch for hours, is the loading and and unloading of trucks and vans. Vehicles don’t drive until they are filled to capacity, then overfilled, and then filled a bit more. 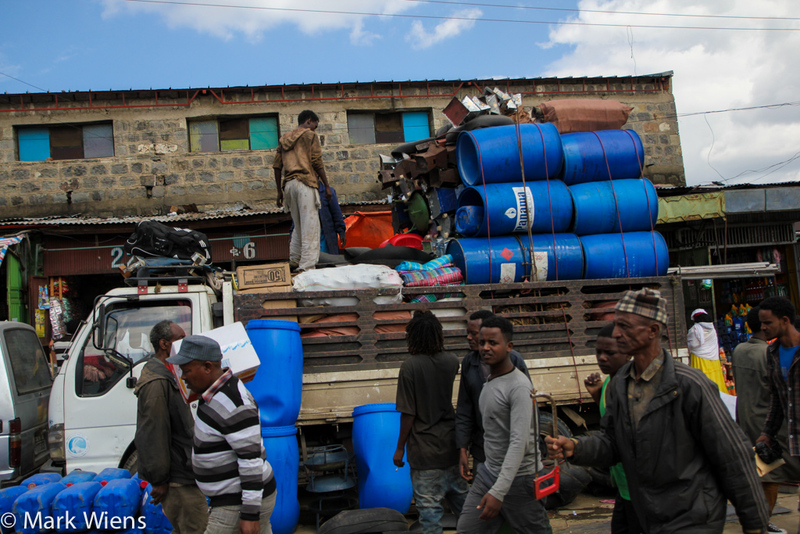 Trucks and vans normally stop on the streets, and then the loads of products are rushed into the inner muddy lanes of the market by human porter or donkey. 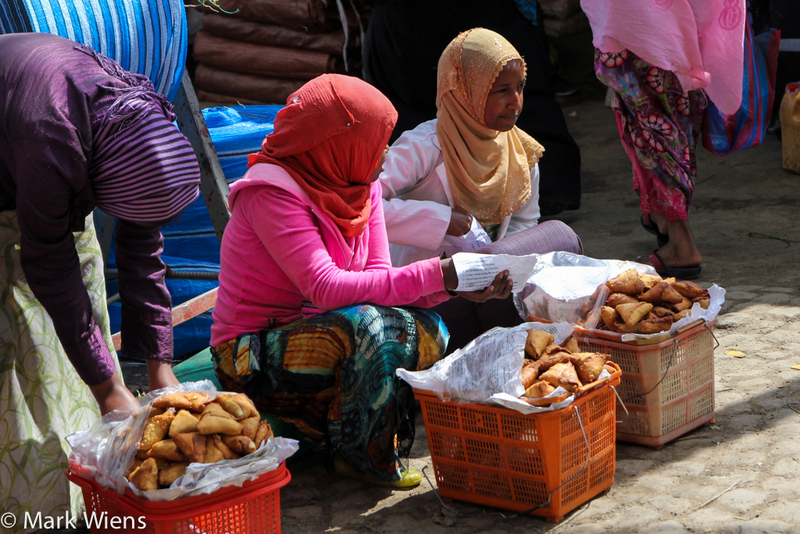 For the hard working porters and shoppers, they can grab a quick road-side samosa and a cup of coffee to refuel before the next load. I wasn’t able to see the full vegetable section, but there were vendors scattered throughout the entire market that were selling herbs and vegetables by the handful and from gunny sacks and baskets. Whatever you’re looking for, you’ll find it. 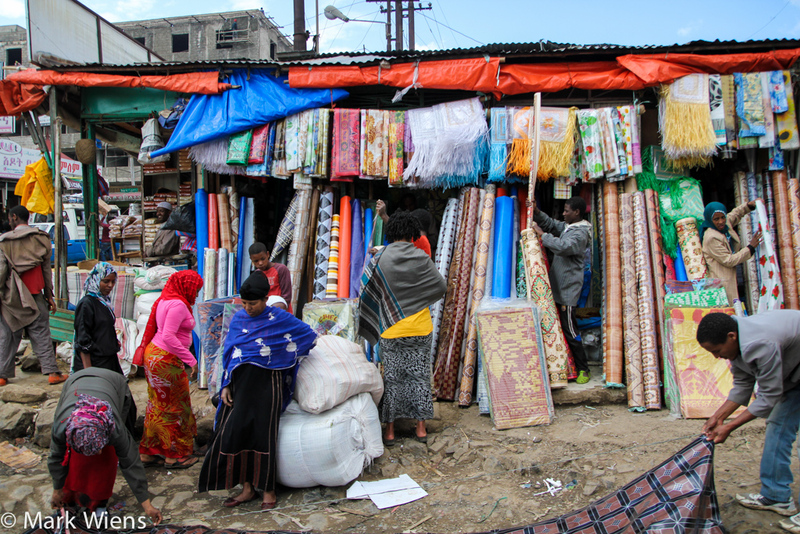 Addis Ababa’s Mercato is one of those markets, that if you know where you look, you’ll find anything you want – the challenge is, knowing where to look. So if you’re just going to the market to browse and walk around to see what you can see, it’s fantastic, but I can only imagine if you’re looking for something specific how long the search could take. In case you need to re-fuel, there are some handy petrol vendors within the market where you can buy some gas. Ethiopian spices, and a mix known as mitmita, is extremely important in flavoring nearly every dish in Ethiopian cuisine. 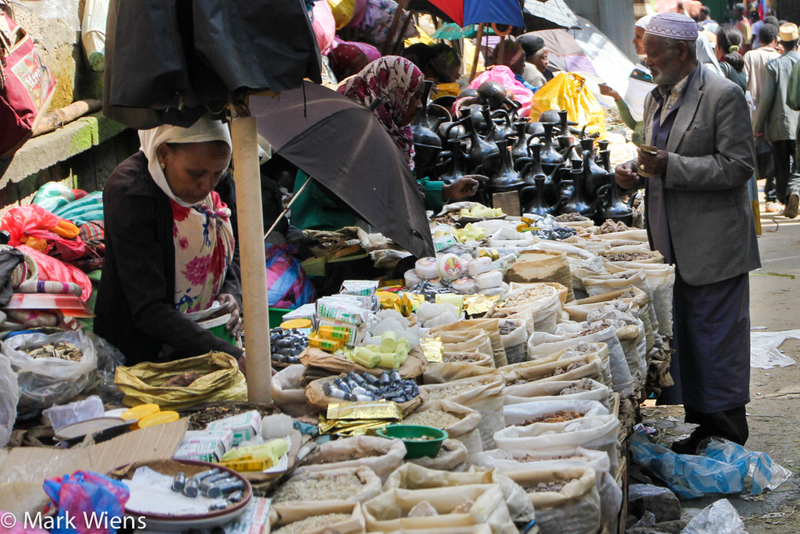 Walking around the markets, in-between catching whiffs of countless other smells, all of a sudden you’ll be walking and a wave of Ethiopian spice will hit your nose with glory. Ethiopian spices are a beautiful smell. Coffee is at the center of Ethiopian culture, and the traditional way of brewing it is in a clay vessel known as a jebena. The one thing I bought while walking through the market is a jebena to bring back to Thailand with me. 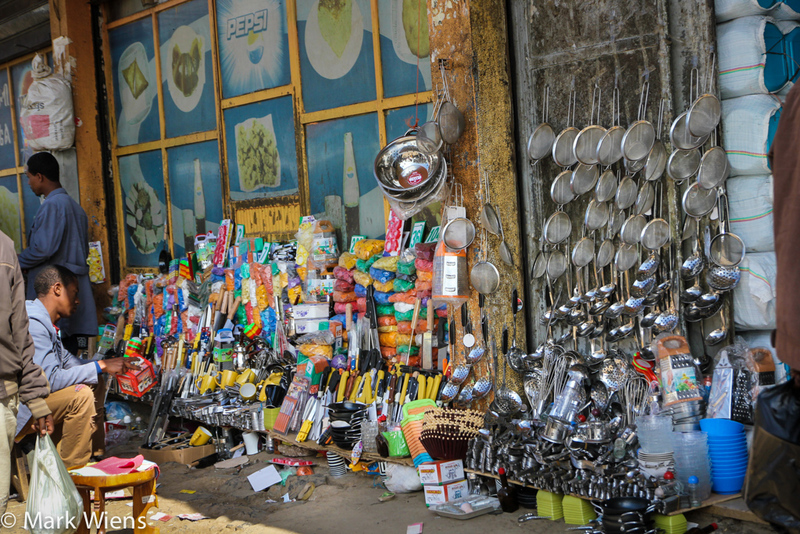 If you want to do a lot of shopping when you’re in Addis Ababa, you’ll find the best deals on just about everything at this market. 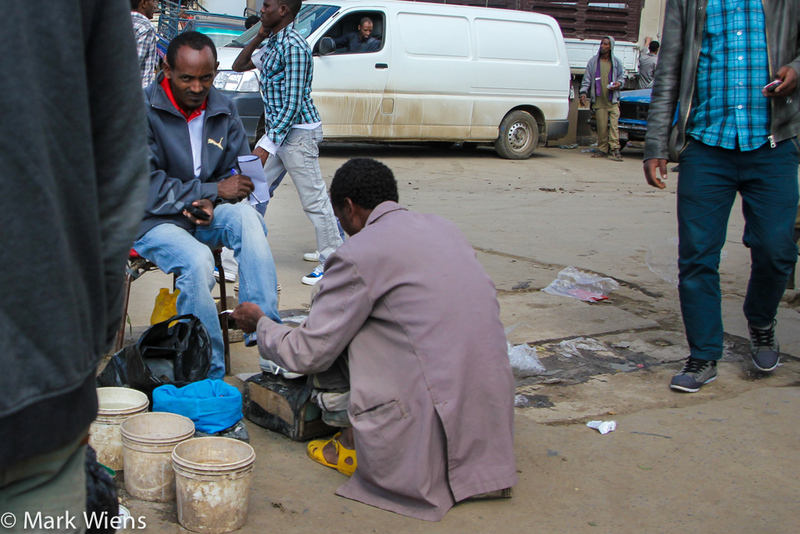 After a couple hours walking around Addis Mercato, you’ll likely need a shoe shine. Depending on the rain conditions, you’ll likely have mud caked on the bottoms of your shoes. 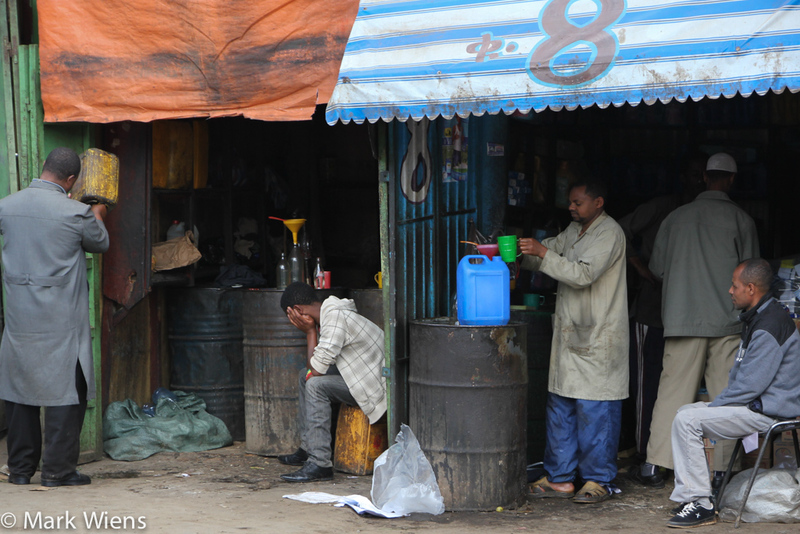 The shoe shiners in Addis Ababa are experts and they will have your shoes looking fresh and new again in moments. 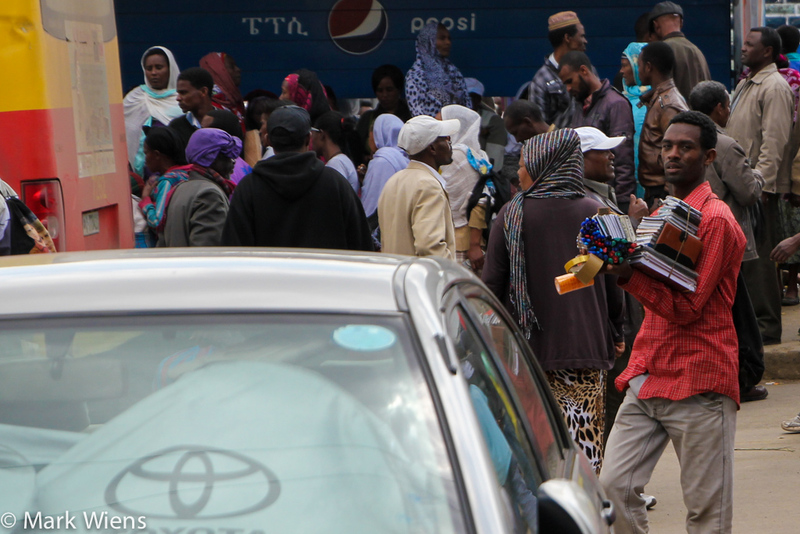 Some Ethiopians in Addis Ababa told me things at Addis Mercato are changing… it’s not what is used to be. 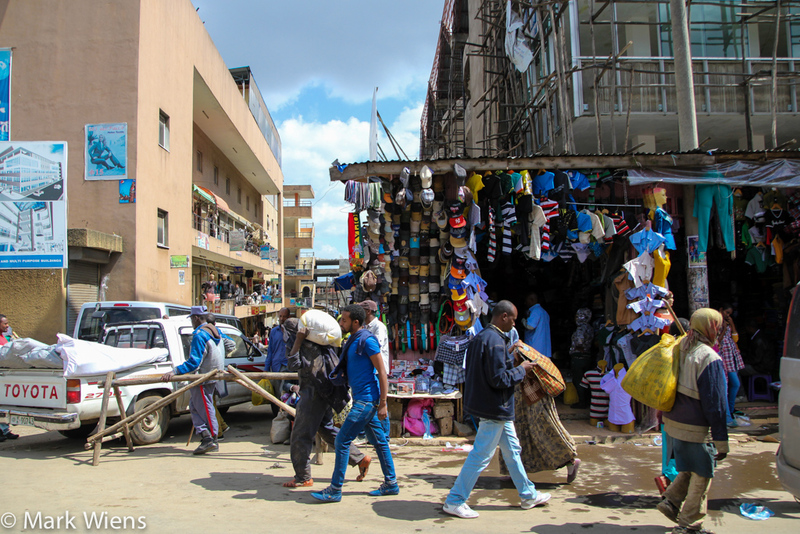 Land is being overtaken and developed, and longtime market vendors in certain areas are being forced to move or shutdown. 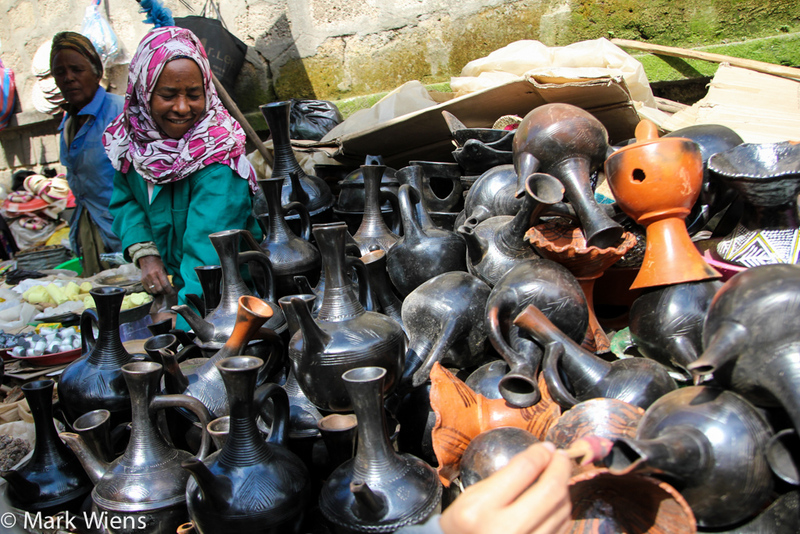 Addis Ababa’s Mercato is a thrill of a market, and while it’s one of the most chaotic places in Addis Ababa, there’s so much beauty everywhere you look. On atripadvisor Manager of Merkato link! Hello there. I’m Ethiopian and I would just like to tell you that it makes me feel so happy to know that my country is appreciated by other people too. Hope you had a great time there. 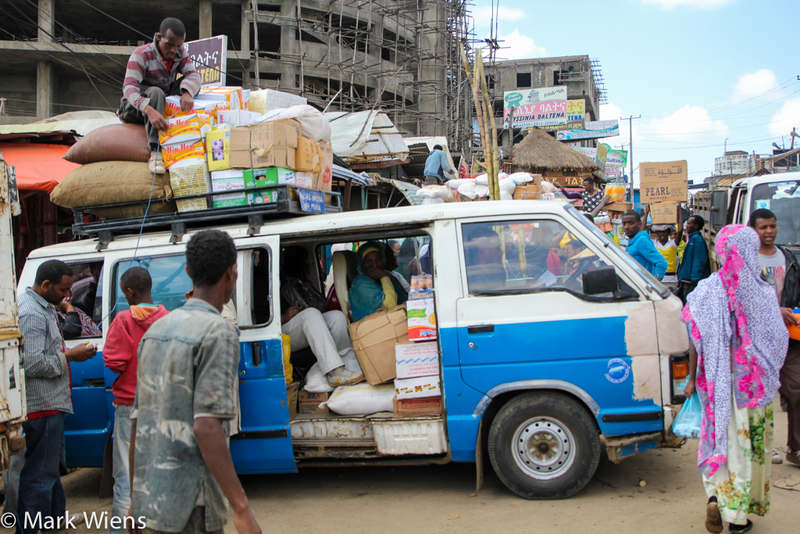 I’m currently living in France and I miss Ethiopia ‘s (and especially Mercato’s) chaos so much. Wishing you well, B.
Hi Bethel, thank you very much, appreciate your kind words. Hope you’re doing well and that you can go to visit Ethiopia soon! hey Mark why u don’t visit Hargeisa -Somaliland haha? any way i like your Youtube videos about your travelling experience and glad to be your fan. Great pictures. Ethiopia is one of my favorite countries in Africa. 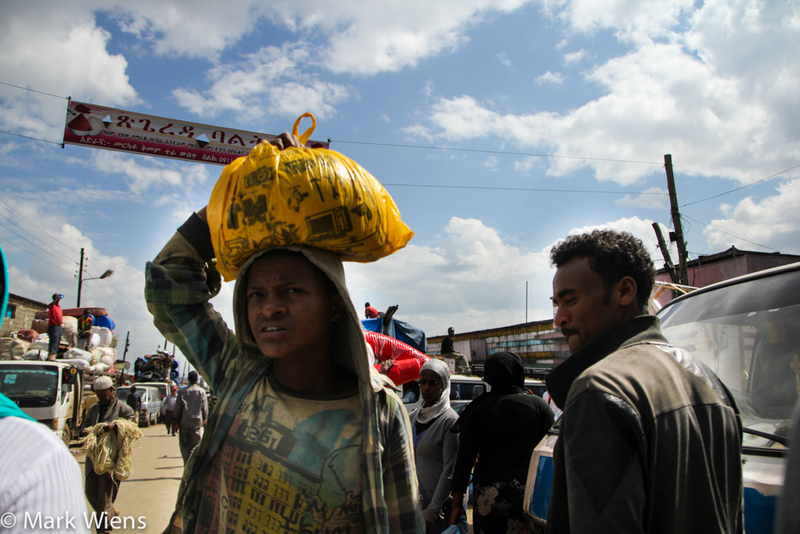 I crossed the border with Somaliland and it was very refreshing. People are much nicer there. 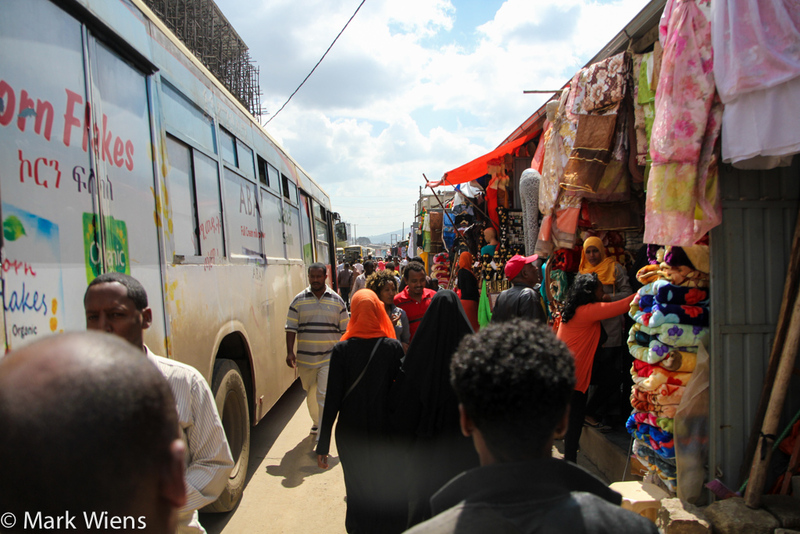 I’m Ethiopian, lived there for nine years, and could never find my way around mercato. seriously, landmarks, unless they are acctually buildings with foundations, something you usually don’t find there. Seriously, one time, my mum wanted to buy me shoes, and she went to a place she knew, only to find that it had transformed into a berbere store. The paths are so confusing! Hey Mary, great to hear from you, glad that I’m not the only who felt a bit disoriented at the market. Haha, love how it could be a shoe store one day, and a berbere store the next. 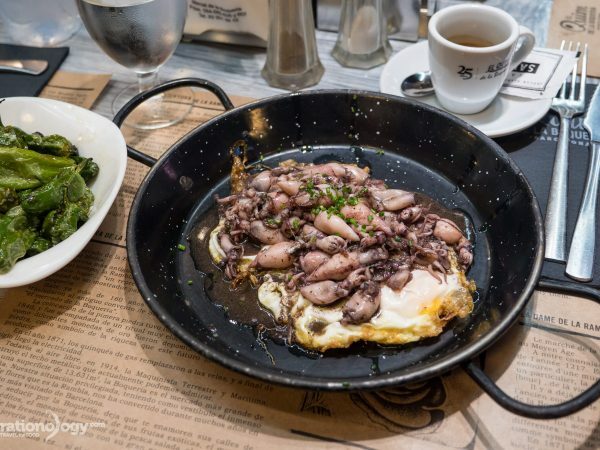 My goodness, what chaos … to be mixed up in a fracas like this is one of the things I just love about travel! Hey Heather, glad you love markets like this when you travel too. Hey Laura, thank you. Ha, I have an aeropress too! I always had fun roaming around this place. Can chill for hours on roof cafe and watch all the goings on for hours. Thanks for sharing Jonny. I didn’t get to a roof cafe, that sounds great. Wow, I really do like the vibes of this market, especially its ‘turbo mode’, as you’ve called it 🙂 The porters and their loading skills are just amazing! The colors are so beautiful! 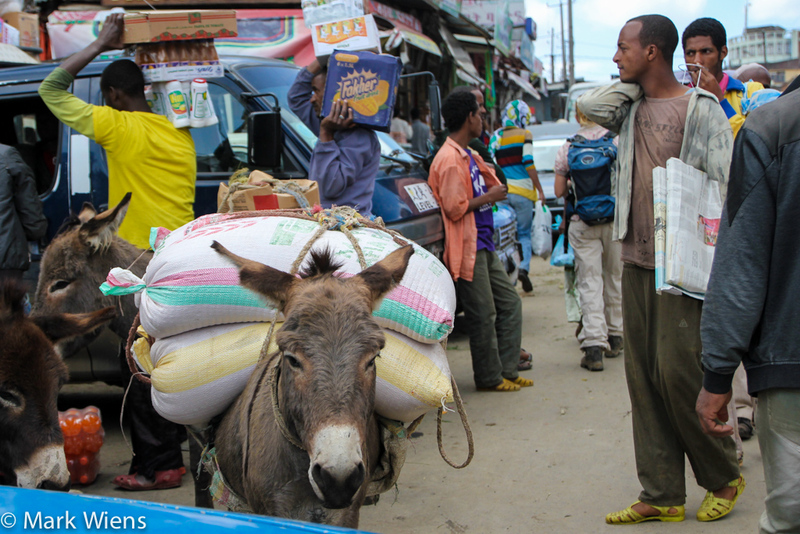 What a richly woven picture of people, colors, and culture such as the overloaded trucks and the donkeys. I love starbucks cappucino and would love to try the coffee the way you described it was made. Thanks for sharing these pictures! Hi Nancy, thank you for reading and for your comment. 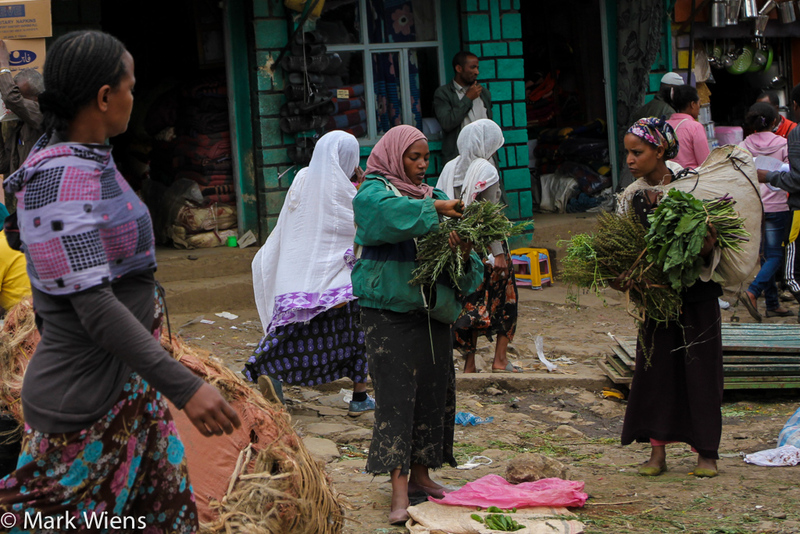 Ethiopia such a rich culture, and so many interesting things to see. Great pictures! I would love to go to Ethiopia! Thank you very much Willem, hope you can visit in the future, it’s an amazing country.